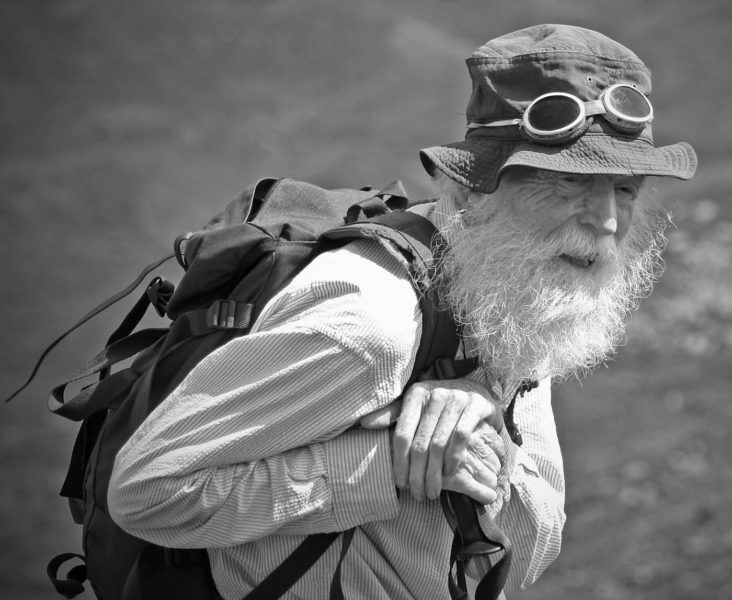 This is a revised and updated version of an article that first appeared in the John Muir Trust Journal in 2005 to mark Adam Watson becoming only the second person after Tom Weir to receive the John Muir Trust Lifetime Achievement Award. Dr Adam Watson was the quintessential guru of the Cairngorms; his knowledge of the hills and his authority across the spectrum of their ecological values unparalleled. He even looked the part, with his full white beard giving him an undeniable touch of Gandalf quality. Adam was one of the founding trustees of the John Muir Trust, serving from 1984 to 1997 and then becoming an Honorary Adviser till 2003. He brought to the Trust immense expertise and authority from a lifetime’s scientific work on the ecology of the Cairngorms, and intense personal commitment to the special qualities of the hills. Born in 1930, raised in the North-East of Scotland, and trained at the University of Aberdeen, Adam worked for the Nature Conservancy and Institute of Terrestrial Ecology for 40 years, mainly in Scotland, but also in Ireland, Iceland, Scandinavia and North America. He was in charge of the NC’s Mountain and Moorland Research Station, 1968-71, and Senior Principal Scientific Officer at ITE Banchory from 1971 to 1990. He retired from ITE in 1990, but continued to work there as an Emeritus Scientist. His writings include more than 30 books, over 500 other publications and over 170 technical reports. These mostly present the fruits of his scientific research, but in later years he published several autobiographical and reflective books drawing on his wealth of varied experience in the Cairngorms and beyond. Adam took to the Cairngorms as a schoolboy, inspired first by the writings and then by the avuncular encouragement of Seton Gordon. From the outset he made the wide-ranging field observations that laid the foundations for his scientific career. His meticulously detailed field notebook records extending over more than 70 years provide a lesson in the outmoded virtues of systematic observation and recording. Thus in the 1940s he began the systematic monitoring of long-lasting snow patches in the Cairngorms, which in recent years he extended in collaboration with Iain Cameron. This work, and his long-term monitoring of animal populations, are highly relevant to the current issues in global warming and impacts of climate change. Adam’s scientific work earned worldwide respect for its exceptional geographical concentration on a single range, but also for its exceptional diversity of subject matter. 40 years ago I acquired undeserved status at a conference in New Zealand simply because I knew Adam Watson. He undertook pioneering studies of animal population dynamics and behaviour – in particular, his research into the behaviour of red grouse and ptarmigan. Adam’s field knowledge of the Cairngorms was unmatched. I well remember how, having come across a lone Scots pine seedling high on Derry Cairngorm, I asked Adam if he knew of other seedlings well above the normal treeline. He had a long mental list of examples, including the one I’d seen, and another that easily capped mine for altitude. He was a field ecologist of exceptional insight and understanding; anyone who ever had the good fortune to share a day in the field with Adam will testify to his capacity to analyse and dissect a habitat before your eyes, disaggregating its component elements and processes and then reassembling them so that you would never again be able to look at the land without that enhanced understanding of its layers and interactions. But Adam’s enthusiasm for the Cairngorms went far beyond his work in ecology. In the decades after the War he was part of the Golden Age of Cairngorms mountaineering when Aberdonians still had the scene very much to themselves, and Bob Scott’s bothy at Derry was the focal point of weekend activity. At that time he did a great deal of rock-climbing, notably with Tom Patey who was checking routes for the long-awaited first Climber’s Guide to the Cairngorms. It was at Derry too that Adam met Tom Weir, who shared many of his interests and became a life-long friend. Adam was a pioneer of Cairngorm langlauf ski-ing, including the first ski traverse of the Big Six in 1962, a marathon so modestly recorded in the Scottish Mountaineering Club Journal that it is easy to overlook the scale of the achievement. He joined the Scottish Mountaineering Club in 1954, compiling successive magisterial editions of its District Guide to the Cairngorms which demonstrate his unrivalled field knowledge of the hills as well as his passionate attachment to them. He was elected an Honorary Member of the Cairngorm Club in 1981. Never a passive ivory-tower scientist, Adam also became a central figure in Scottish mountain conservation. He played a key role during the campaign against the Lurcher’s Gully ski development in the early 1980s, and particularly at the Public Inquiry in 1982, where his intimate knowledge of the mountains, his decades of detailed records, and his huge commitment of time and effort were major factors in the ultimate success of the conservation case. The story goes that the late Bob Clyde, manager of the Cairn Gorm ski centre at that time, was heard to complain bitterly in the pub that “Adam’s up there counting the bloody boulders !”. He served as a Commissioner of the Countryside Commission for Scotland in 1990-92, and was a member of the Cairngorms Partnership from 1995-97. He was scientific advisor to the Mar Lodge Consortium including the JMT which planned to buy that estate before the National Trust for Scotland stepped in; and he carried out monitoring on all three ski areas in the Cairngorms as a consultant. Adam always scorned conventional career paths and establishment honours, but as well as his John Muir Lifetime Achievement Award and many other distinctions, he was awarded honorary Doctorates from Stirling and Aberdeen Universities, while his portrait now hangs in the Scottish National Portrait Gallery. Adam had an easy rapport with all kinds of folk. He had the admirable virtue of plain speaking, which he could do very effectively in the North-East Doric ‘spik’; he had a wonderful store of scurrilous and humorous tales from farmers and ghillies that he could put over in that characterful dialect. He also learned Gaelic to allow him to record the dying vestiges of Braemar Gaelic. 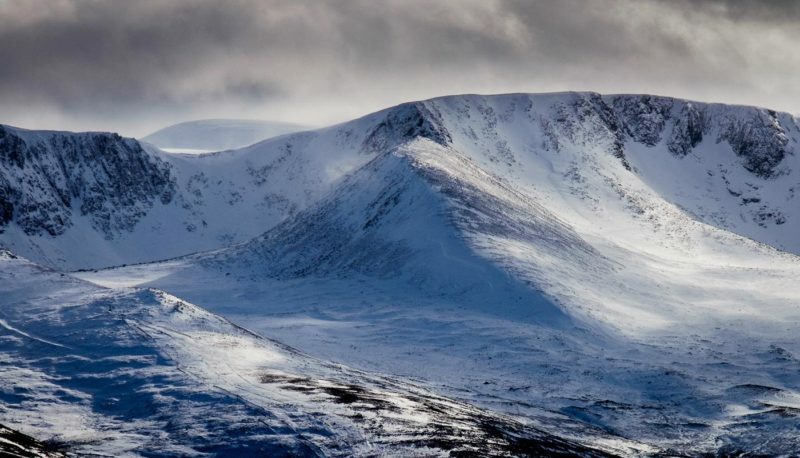 “I have travelled the globe widely – Arctic Canada, the United States, Scandinavia, the Alps in Italy and Switzerland and many more outstanding places – but every time I return I still think that the Cairngorms are the most wonderful place on earth.